I saw this craft a long time ago here on my friend’s blog (which, by the way, I recommend you visit for some amazing craft ideas. Vini aka Pooh is a friend of mine from school. She is one of my constant inspirations in blogosphere!). As always, I kept putting this off for later due to the lack of googly eyes and color papers. It was then another crafty friend of mine (you can find her handiwork here) introduced me to Itsy Bitsy – the one stop online store for all arts and crafts products. Their products are so reasonably priced. They offer a wide variety of products and they deliver it super fast. Without wasting time, I placed my first order of googly eyes, craft sticks and pipe cleaners! I picked the color papers from a paper mart in general bazaar! As for the book ‘The Very Hungry Caterpillar‘, it is a children’s classic highly recommended for kids aged 1 – 3. 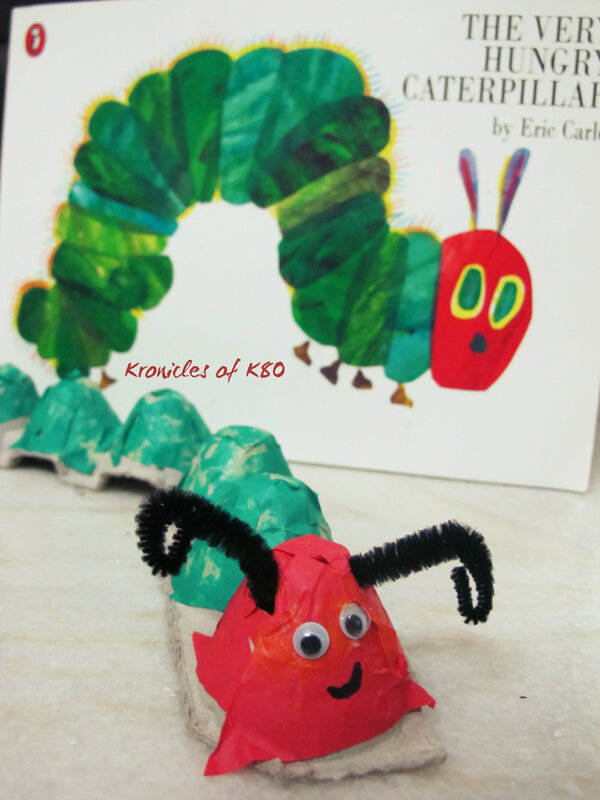 Eric Carle, the author of the book, colorfully illustrates the life cycle of a caterpillar. He also beautifully introduces the child to counting and days of the week. I remember reading this book as a child. Now it’s one of KT’s favorite. The paperback imported version of this book is available on Flipkart for just Rs. 150. This craft would be more fun and meaningful once the child has been read this book a couple of times!